The Brown County Veterans Memorial was dedicated on Veteran’s Day, 1999. This memorial was designed by C.J. Schmidtke and received recognition in a national trade magazine for its unique features. The project was initiated and developed by the Brown County Veterans Council. This memorial was presented to Brown County as a lasting tribute to past, present and future veterans who honorably served in the Armed Services of the United States of America during periods of peacetime and designated periods of armed conflict. 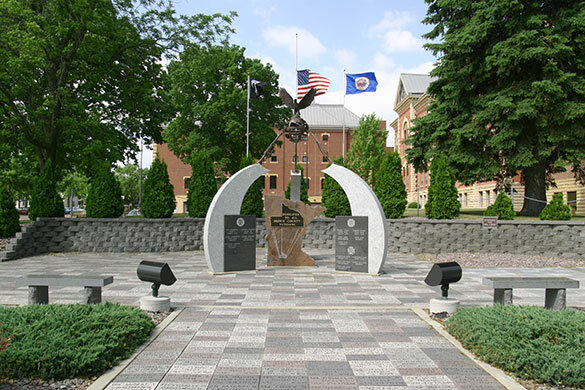 The Eternal Flame, funded by a grant from the New Ulm Area Foundation, was installed in 2001 to draw attention to the memorial in recognition of those men and women who served to preserve freedom in the free nations of the world. There are currently 2,065 commemorative paver blocks at the memorial site; space for 130 pavers remains. Contact the Brown County Veterans Service Office for information on purchasing a paver block at 507-233-6636. Location: 14 South State Street, on the front yard of the Brown County Courthouse.